You won’t find me posting too many reviews of New Zealand Sauvignon Blanc <cough> they all taste <cough> the same <cough>! Wow! I’m sorry. I really need to get to a Doctor with that cough! So anyway, as I was saying, New Zealand Sauvignon Blanc’s; notorious for their crisp, refreshing, aromatic, grapefruit, and freshly squeezed lemon / lime flavors. The quintessential outdoorsy spring / summer wine. A little unfair to say that they all taste the same (in wine there are very few absolutes); but if I was to do a side-by-side comparison, and post the tasting notes on this website, I would very quickly start running out of descriptors that would differentiate between the different bottles! My mouth is watering just looking at this photo! I don’t think I’ve ever actually peeled and segmented a grapefruit by-hand before this recipe. Word of advice: get a sharp knife! By sharp I mean SHARP! Removing all that pith is impossible without one. Don’t cheat and buy it already segmented! It’s not the same! The recipe I chose to pair with the Spy Valley New Zealand Sauvignon Blanc was Scallops with Grapefruit-Onion Salad. Not rocket-science, and I would have been very surprised if this pairing hadn’t have worked! The one thing I take away from this photo is that I really need to clean my grill! Oh well. The recipe actually calls for lightly sautéing the scallops in a pan. However, with the weather we’ve been having down here in sunny Jacksonville Florida, that just wasn’t an option. I take every opportunity I can get for a little sunshine on my pale English complexion. Therefore: TO THE GRILL WE GO!!! The Scallops with Grapefruit-Onion Salad recipe has really been put together more as an appetizer than anything else; but with a little spinach, and some almond and olive oil tossed in, I easily transformed it into a super-healthy full meal. To have not eaten this outside would have been a terrible injustice! No question, this pairing was a runaway success; and simple too! I can’t remember the last-time I used pickled cocktail onions to cook with. They bring back memories of crappy childhood birthday parties in England, where the culinary-wizard-of-a-mother of the birthday boy/girl would (without fail) always make a “hedgehog”. 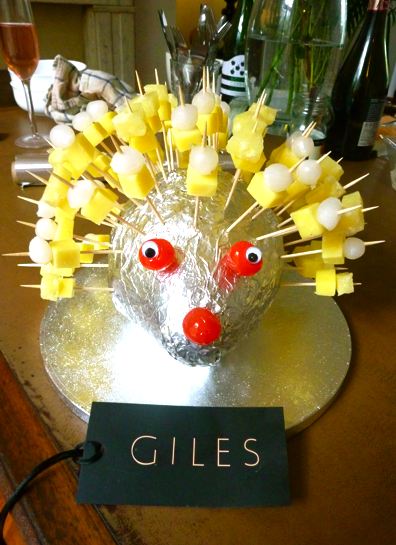 This by sticking a piece of pineapple, a cube of cheese and a cocktail onion onto a tooth-pick; and then stab them into an unsuspecting tin-foil covered melon for a delightful but slightly creepy center-piece. Have no idea what I’m talking about? Click here. So even though the recipe was easy to the extreme, the simple and fresh ingredients really stood out for themselves. The pink grapefruit, of course matching beautifully with the citrusy nature of the NZ SB. The pickled onions added an acidic element, which I didn’t think would of worked, but seemed to pick-up on the prominent minerality in the wine. The scallops themselves were just thrown onto the grill for about 7 minutes; with the citrus-dominant nature of the wine really acting as freshly squeezed lemon / lime juice. The Spy Valley really is one of my go-to Sauv Blanc’s as far as New Zealand goes. It usually sits around $17 retail, and can easily match any of the higher-end examples for taste. Fascinating fact for you: if you pickup a bottle of the Spy Valley Sauvignon Blanc, take a look around the foil capsule at the top. It’s Morse-Code which spells out “SPY VALLEY”. we certainly can’t say that about them. Recipe sounds delicious, personnally I always segment my citrus fruit and nothing but a good sharp knife will do , unless you want a smoothie on your hands, perhaps remnant from my days in hotel/restaurant/culinary college. Man those old people who came to the elegant restaurant every day, lined up 1/2 hour before opening time, you could see them through the double glass doors, like 5k runners waiting for the gun, ready to pounce, using elbows ( well not quite, well I can’t be for sure they didn’t do it either), on a somptuous meal that would certainly fetch 75 to 100 bucks back in the 70’s, but for them a mere 19 francs, yes I am talking 3 dollars. One of them , Mr Salomon, who was also our Oenology teacher demanded of us to wear the mandatory heavy blue robe to attend his class, there wasn’t gonna be any smelly hairy individualistic punks in his class,(no t-shirts expressing adoring love for Britney Spears or some other crazy lady Gaga , would be tolerated) I’m surprised that the robe wasn’t red and that we never ever had the privilege to meet chairman MAO. Another one of our teachers was a cool old guy, Mr Cassini, except for his hair covered ears, it wasn’t disorderly in any way, as a matter of fact it was well trimmed and groomed,but there was so much of it. These are what memories are made of. P.S. try a fennel/orange salad, if you have not already, and I also recommend for grilled lamb chops (a “sauce” of olive oil/lemon juice/garlic/thyme) to dip them in. :) Thanks Alain! Just got round this this comment! Thanks (as always for taking the time); I think I might just have to take your advice on the lamb chops!